The entertainment industry is forcing the consumer to adopt nascent 3D technology. Watch a Hollywood blockbuster and, now, it's 'also' available in 2D. Consider purchasing a premium LCD or plasma TV and the specs will doubtless scream '3D compatibility.' Like it or not, 3D is here to stay. PC graphics-card manufacturers have also been pushing 3D of late. 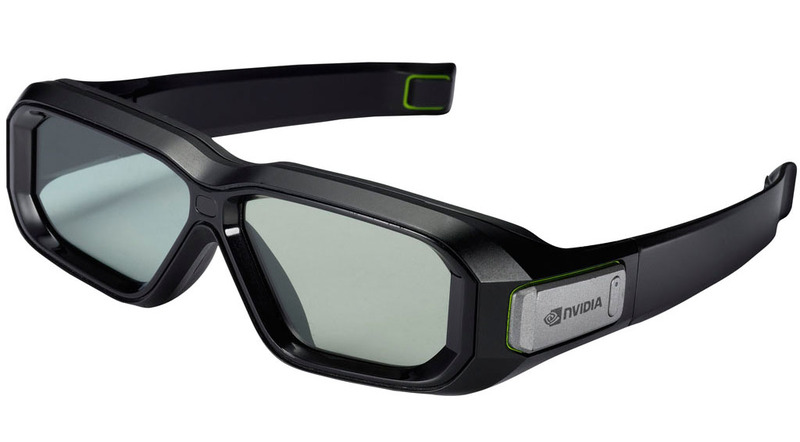 NVIDIA, especially, has recently put greater stock in the inchoate stereoscopic three-dimensional technology by bringing the second iteration of its 3D Vision initiative to market. But let's take a step back first. The Achilles' Heel of any active-shutter 3D design rests with the dimmer-than-normal picture produced when viewing through the glasses. Active-shutter technology, as used by NVIDIA, relies on quickly opening and closing shutters such that a different frame is shown to each eye in sequence. Combine the frames and a 3D image is created, with your brain filling in the gaps. Trouble is, closing the shutters intimates dimness - the world is darker when the shutter is closed - and thus this dimness is an inherent problem that's not easily overcome, more so if the shutter needs to be kept closed for any length of time. NVIDIA's solution with 3D Vision 2 is to reduce the time the glasses' shutters are closed: simply keep the shutters open for longer. Sounds easy, doesn't it? The praxis isn't quite as straightforward, unfortunately, as minimising shutter-closing in conjunction with present 3D Vision-certified panels wreaks havoc with the way the eye-specific frames are generated and processed. Faster-switching shutters work if more light gets through, and this is why 3D Vision 2 requires newer, brighter screens. The premise here is to boost the backlighting such that the glasses' shutters don't need to be closed for as long: there is cause and effect. 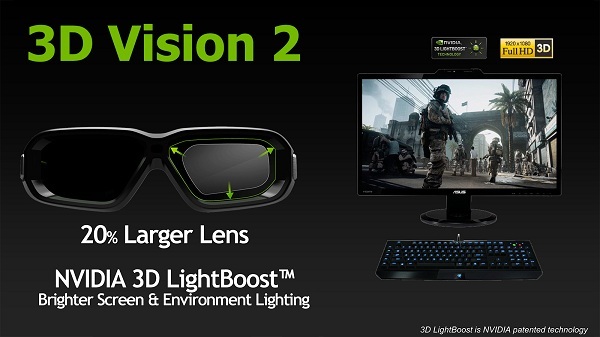 This is 3D LightBoost technology in a nutshell - brighter monitors that enable lenses' shutters to close more quickly. A by-product of 'less-blocked' shutters is brighter ambient lighting conditions in 3D mode, too. You see, it's all about the monitors, or, more precisely, the relationship between brightness and glasses-side shutter closing. Understand this and you realise that the one absolute change is the screen; older-generation glasses and the associated emitter can be used, once firmware-updated to accept the new shutter-speed regime. This is a wise move by NVIDIA as the glasses still remain a significant investment. Speaking of glasses, it would be rude not to show you just how they look. The newer glasses have a chunkier, more industrial look than the first-generation specs. 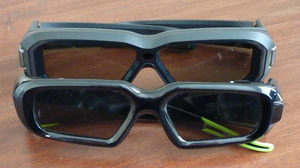 Now both arms are almost the same thickness near the lenses, achieved by moving to a micro-USB connector from a mini-USB version. There's less of a feeling of glasses with 3D Vision technology simply bolted on, as is the case with the original specs in the foreground of the right-hand picture. 3D Vision 2 glasses are a smidge heavier - 56g vs. 50g - but the weight feels more evenly spread through the frame. Subjectively speaking, they second-generation model fits better over ordinary specs and, due to the larger size of both lenses and frame, there is less 'interference' from external light sources. The newer glasses provide more of a cocoon, enveloped feeling when looking at the monitor, and this is important as 3D-compatible screens become larger and focus is drawn from the centre to the spaced-out edges.